How Realistic Is Donald Trump's Immigration Plan? : It's All Politics Donald Trump had lacked for policy specifics until he came out with his very specific, hard-line immigration plan. But some of those in the trenches of immigration reform say it's dead on arrival. 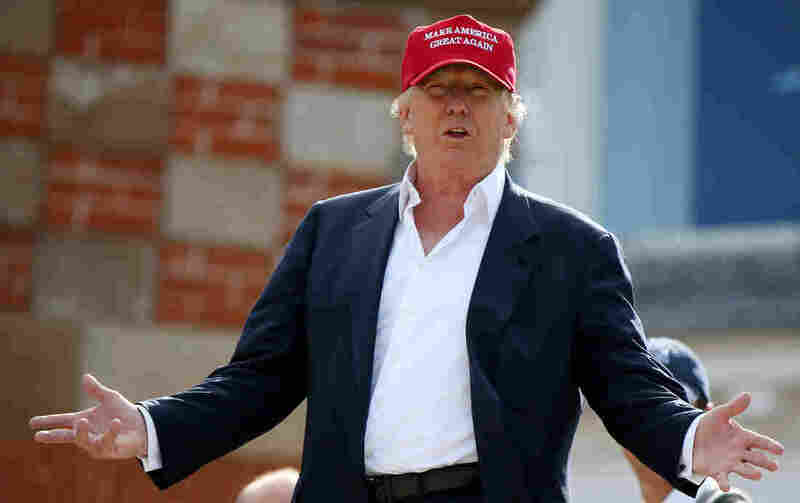 Donald Trump wears what's become a campaign signature: his "Make America Great Again" hat. Part of making the country great again, Trump says, is implementing his hard-line immigration plan. "I will build a great, great wall on our southern border," Trump has said, "and I will have Mexico pay for that wall, mark my words." Even people who support tough immigration reform question whether Trump has the right answers. For instance, anyone with an elemental understanding of border security knows how hard it would be to build a continuous wall along 2,000 miles of the Southwest border because of rough terrain and private property rights. Beto Cardenas is a Laredo native, who served as general counsel to then-Sen. Kay Bailey Hutchison, R-Texas, during immigration debates. "When it comes to the idea of border fencing, there is a difference that is needed in one county versus another," Cardenas said. "You cannot say there is one solution that fits all." Perhaps Trump's most controversial idea is to round up all 11 million or so immigrants who are in the United States illegally and send them home. "We will work with 'em," Trump said before adding, "they have to go." Kerry Talbot, an immigration lawyer who worked for Sen. Bob Menendez, D-N.J., was a key negotiator who helped come up with a bipartisan immigration bill that passed the Senate in 2013 (and failed in the House). She dismissed the idea of deporting everyone in the U.S. illegally. "That's just not a solution that is workable," Talbot said. "It's not possible to deport 11 million people." She added, "And so the Senate negotiators realized that, and they understood that, you know, you just have to work with reality and what's possible. And you need to look at people's connections to the U.S., what kind of contributions they're making. And Trump doesn't look at any of that. He just wants to deport everyone." Immigrant families often have mixed legal status. Take the family of Juan Belman — a 22-year-old university student in Austin. He and his 17-year-old brother were brought here illegally from Mexico as young children, and they identify as Americans. His two other little brothers were born in Texas and are U.S. citizens. Belman wants to know, in Trump's hypothetical administration, what happens to a family like his? "I don't see how that's going to work," Belman said, "how that's going to look good for the United States. It kind of breaks my heart that people think this way, that people have this idea of separating us, of deporting us." Trump does, however, get praise for including some ideas that deserve deeper discussion. The government has a voluntary program called e-Verify, where employers check an employee's Social Security number to make sure he's legitimate. Trump wants to take e-Verify national and make it mandatory, as a way to eliminate the magnet of jobs. "I think that a mandatory verification system is an important part of immigration enforcement," said Doris Meissner, a former immigration commissioner under President Clinton. She now works for the nonpartisan Migration Policy Institute. "And I think that's one of the interesting things about his proposal is that he mentions it. But there's just a short sentence. It doesn't tell us anything about how you actually would do it." Despite their shortcomings, Mark Krikorian says Trump's immigration recommendations are the most thorough of any Republican contender, next to Florida Sen. Marco Rubio, who supported the Senate's comprehensive immigration plan. Krikorian is the executive director of the Center for Immigration Studies, which calls for stricter immigration laws. He is no Trump fan, but gives him credit for bringing immigration to the forefront in this campaign. "Individually, as a citizen, I would not want this guy to be president," Krikorian said. "I mean, look, he's a bloviating megalomaniac. But he has, in fact, made a significant contribution to the immigration debate. We are now debating policy issues that nobody wanted to or cared to talk about before. So that's all to the good in my opinion."